The undisputed protagonist in the family of Sicilian marbles, the Perlato di Sicilia. A variety that due to its high technical and aesthetic features can boast of being the marble used for the construction of the new Central Station of Milan, as well as being also present within the Basilica of San Pietro. Perlato Siciliano is a material that is always current and suitable for many uses thanks to its technical and aesthetic characteristics. The quarries from which the Perlato di Sicilia is extracted are concentrated in the area of Custonaci, in western Sicily, where this fine variety is processed and produced to be used in various sectors, from the preparation of urban furnishings to interior architecture and external. Pride of the territory of Trapani, the Perlato di Sicilia has a notable market not only at national level, but on an international scale, required above all in the area of the United Arab Emirates. The name Perlato di Sicilia derives from the splendid aspect of this marble that makes the environment in which it is used unique. Mainly composed of fossiliferous limestone, it has a light brown arabescato ivory color with a range of more or less dark shades and the characteristic pure calcite blotches that recall the marvelous pearly appearance of the inside shells. The brownish-brown veins are the effect of the concentration of clay minerals and iron oxides, while the brown specks are due to the presence of microfossils which, imprisoned in the marble, make it incredibly elegant and precious. 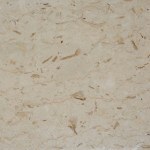 The characteristics of Perlato di Sicilia make it an excellent product in terms of quality and aesthetics. Perfect decorative material for urban and interior furnishings of a certain style, the Perlato di Sicilia can be used both for flooring and for coverings, even outdoors.